experience — and is visually arresting to boot. With over 40 years in the industry, production designer Hans P Bacher is acknowledged as one of the legends in animation film design. His work with Walt Disney Feature Animation, Richard Williams, and Steven Spielberg’s Amblimation saw him create the production design for such historic films as Who Framed Roger Rabbit, Beauty and the Beast, Aladdin, The Lion King, Balto, Hercules, Dinosaurs, Fantasia 2000, Mulan, Lilo and Stitch and Brother Bear amongst several others. He is a member of the Academy of Motion Picture Arts and Sciences and has been honoured with the Golden Camera Award and an Annie for outstanding individual achievement in Production Design. Previous books, Dreamworlds: Production Design for Animation and Sketchbook: Composition Studies for Film, are hugely successful. He now lives in Singapore where he passes his knowledge to students at the prestigious Nanyang Technological University. Co-author Sanatan Suryavanshi is an Art Director living in Toronto. 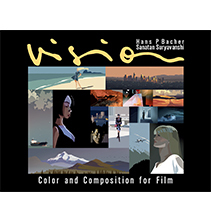 A graduate of Sheridan College, Toronto, he attended the Masterclass of Hans Bacher, and has collaborated with Bacher from the start of the book. Over a period of seven years he has helped to develop the concept, visuals and text. Most recently, Suryavanshi was the Art Director at Guru Studio for Cartoon Saloon’s The Breadwinner, responsible for designing the light and color for the production’s ‘storyworld’ sequences. Prior to this, he was Guru Studio’s lead development designer defining an original look for several projects including True and the Rainbow Kingdom and Midnight. Currently, he splits his time between development work on feature films, production designing for an undisclosed Cartoon Network show, and helming the prestigious Crush Visual development studio as Creative Director.